Acrobat으로 PDF을 열었을 때 다음과 같은 메시지가 나오면서 PDF 파일을 전혀 수정할 수 없을 때가 있다. "The file you have opened complies with the PDF/A standard and has been opened read-only to prevent modification." 읽기 모드로 열려 새로 저장하는 어떤 작업도 할 수 없게 된다. 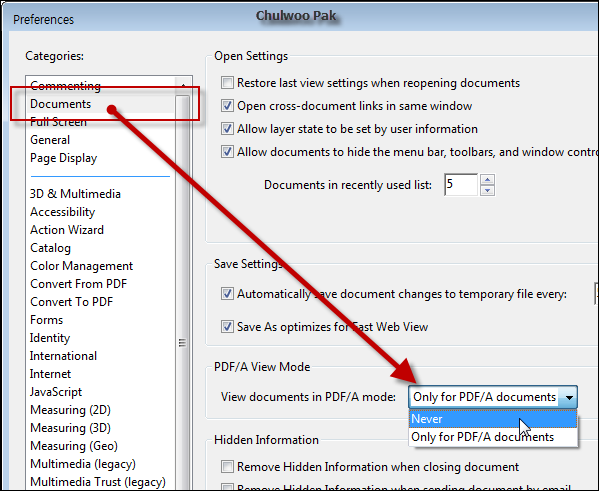 이때에는 [Edit] > [Preferences...] 메뉴를 열고, Documents 카테고리의 PDF/A View Mode 항목을 "Never"로 선택하면 된다.